Safety Note: this craft involves melting wax so requires adult supervision. You may also want to cover your surfaces as it can get messy! Fill the pan one third full with water and place on a gentle heat. Put the bowl in the pan, making sure it doesnt touch the bottom of the pan. 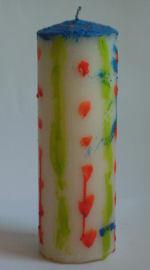 Wash out the bowl and repeat with another colour until you are happy with your candle. You will find that the brushes set hard so you will need a new one for each colour. Remember that candles should only be lit by adults!